I've had a lot of friends and family tell me how much they loooove reading about my life as the Outreach Coordinator at the Alaska Zoo. So, when I was hanging out with one of my furry friends the other day, I thought why not start something new? Every week [or at least until I get bored of it], I will bring you "Creature Feature", a glimpse into the lives of some of my furry, and feathery, Alaskan animal friends. Love it? Feel free to leave me a comment! Have a question about the Zoo or what I do? 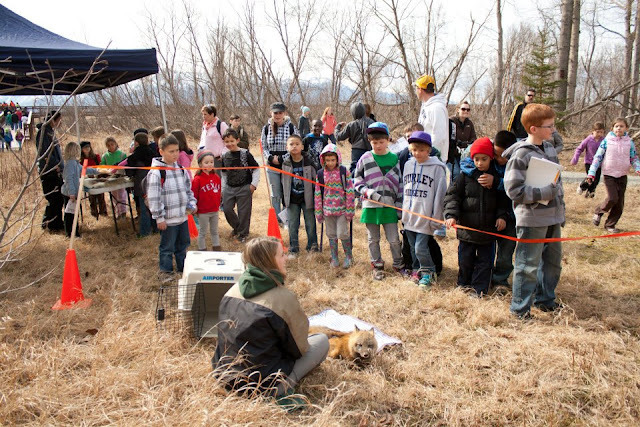 How we train an animal for outreach? Or maybe about an Alaskan animal inparticular? Ask away! The red fox, best known for it's reputation as a cunning and intelligent animal, is common in most of northern North America and throughout Alaska. They are members of the dog family and their general appearance is similar to domestic dogs, wolves and coyotes. An adult weighs from 6 to 15 pounds, but they always appear heavier than they actually are, probably due to their thick fur coats in the winter. 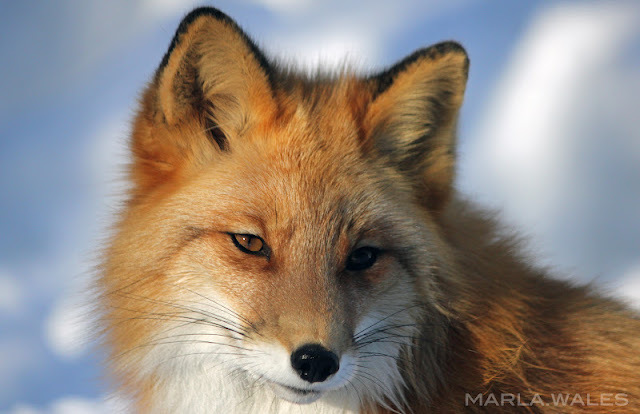 Red fox are easily recognized by their reddish coats, however, not all red foxes are red! They have many color variations including red, silver, black or cross. The white tip on the tail is what distinguishes this fox from other species, regardless of its color phase. Although red is definitely the most common color phase, several color phases can occur in a litter, similar to a person having different color hair than their siblings. The red fox is an omnivorous animal, and often opportunistic. 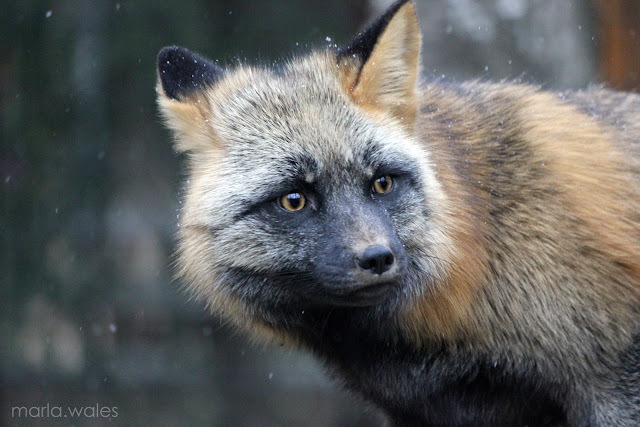 They will eat both plants and meat, but similar to a omnivorous human prefering a juicy steak over some brussel sprouts, red fox also prefer their meat, often hunting smaller animals, such as voles, muskrats, squirrels, hares, birds and bird eggs. While related to wolves, their hunting style is entirely different. They are solitary animals, hunting by themselves, and mostly like a cat, with the stalk and pounce approach. With their excellent hearing and sense of smell, they can pinpoint the vole, sometimes under snow and leaves, creep up to it quietly and then pounce six feet in the air, pinning it to the ground. They've got some serious skills. 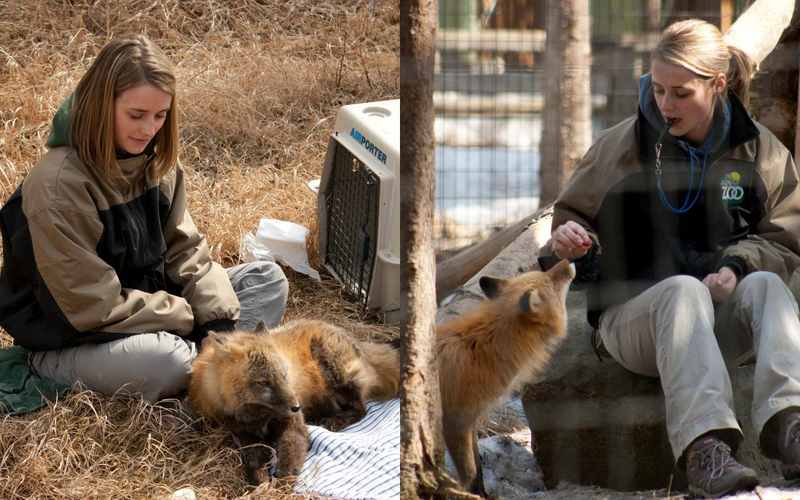 I currently work hands-on with three of our seven red fox, taking one to visit students in their classrooms and training the other two in hopes that they too can becomeeducation animals and teach others all about their wonderful species! I am in the process of halter training my man Mac (red phase above) and it has been one of the most rewarding experiences I have ever been a part of. Outreach at Potter Marsh Discovery Day with Chance. The Alaska Zoo a 501(c)3 nonprofit dedicated to promoting conservation of Arctic, sub-Arctic and like-climate species through education, research and community enrichment. We have provided a home for injured, orphaned and captive-born animals for over four decasdes and are proud to offer quality programs and events for Alaskans and visitors. If you are ever in Anchorage, make sure you visit us! For more information on my furry friend the red fox, visit the Alaska Department of Fish & Game's website here. Marla! I'm so sad I never got to meet you, but I hear so many wonderful things about you. I'm so happy you've started a blog. It's awesome to see such beautiful pics--I still miss those guys so much!--and I'm looking forward to hearing your updates!